J. Paul Getty was an avid collector of art and antiquities; his collection formed the basis of the J. Paul Getty Museum in Los Angeles, California, and over $661 million (approximately $2.7 billion in 2014) of his estate was left to the museum after his death. A birth chart (also known as kundli, janma kundali, or horoscope) is a map of heaven at the time of birth. 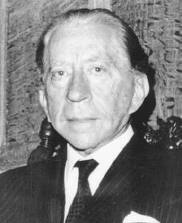 J. Paul Getty's birth chart will show you J. Paul Getty's planetary positions, dasa, rasi chart, and zodiac sign etc. It will also allow you to open J. Paul Getty's detailed horoscope in "AstroSage Cloud" for research and analysis.